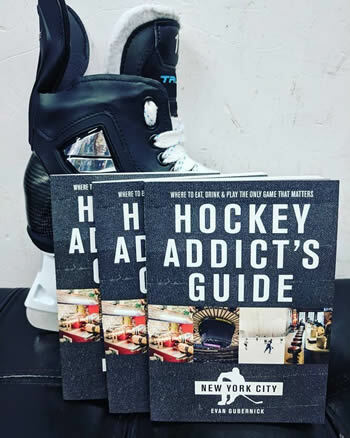 There are two Hockey Addict's Guides out at the moment from the accidental travel-guide/beer hockey player Evan Gubernick. The first served his home of New York City, and the second was Toronto, and a third, coming at some point down the road, will be for sunny Los Angeles. The subhead, “Where to Eat, Drink, and Play the Only Game That Matters,” gives readers a clue that it's both a passion project, but also about more than just hockey. Gubernick took a unique path to get to this point, for sure. He was an art director and creative director in publishing for many years. 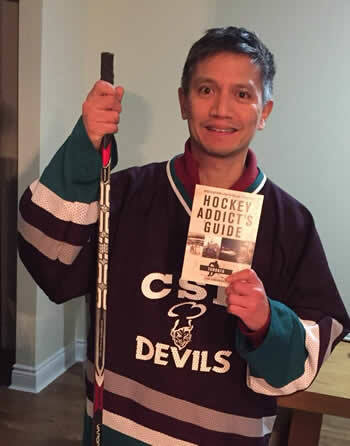 When his son started playing the game, Dad got the hockey bug too. From there, he started doing a website (www.snipetown.com) about local hockey in New York. “Getting in the locker room with all these different people, from all these different walks of life, just started to fascinate me,” he said. The site grew and eventually attracted the attention,W.N. Norton & Company, which has published the books under its Countryman Press imprint. They called in Gubernick and discussed what a book could be. To Gubernick, it's a “local travel guide but seen through the eyes of the hockey community, which took a minute to figure out what that would look like, and frankly, I'm still figuring it out. As it turns out, every city is so different that I have to deal with it differently, let alone the degree to which hockey is a part of the city.” So if you're hunting it down in a bookstore, it might be in the travel section rather than sports. Getting input from others is a big part of the project, even in New York, where he knew a lot of the hockey spots. For Toronto, Gubernick's chief contact was Rob Del Mundo, who is affiliated with “The Maven” Stan Fischler and runs www.tmlfans.ca. 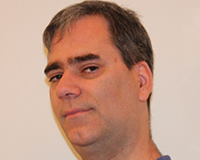 “It was a fun project for me to work on; a rather unconventional twist to my sportswriting,” said Del Mundo via email. “I did interviews with: Natalie Spooner of Team Canada, Kyle Baun (then) of the Marlies, Dave Bidini, Tim Thompson, Mike Wilson and Phil Pritchard. I also called upon several media colleagues to help out: Christine Simpson, Paul Hendrick and Natasha Staniszewski all contributed, as did David Shoalts (via Evan). However, we didn’t focus exclusively on celebrities. We also had responses from several beer leaguers, and I called upon my own teammates, plus our commissioner, to participate.” Gubernick made a couple of trips to Toronto himself to look around. Gubernick believes hockey fans are loyal to each other. “If you're a fan or an addict of hockey, you're going to trust the people in your community to give you opinions about things outside of hockey,” he said. To that end, the Los Angeles book has gotten some help from fellow players. “I was playing in a tournament in New York last summer and met some folks from the beer league community out in L.A. and they walked me through what it was out there, and at that point, I said, 'I'll do L.A,'” said Gubernick, who's been out to L.A. once already. It's a different challenge than Toronto or New York City, for sure, but with teamwork—writers, players, photographers, and more—it'll be another winner. 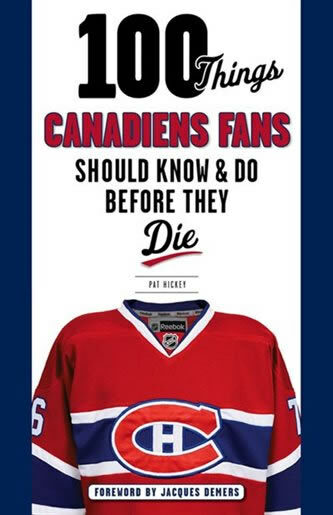 The Montreal Gazette's Pat Hickey has two books out in two separate series from Triumph Books. 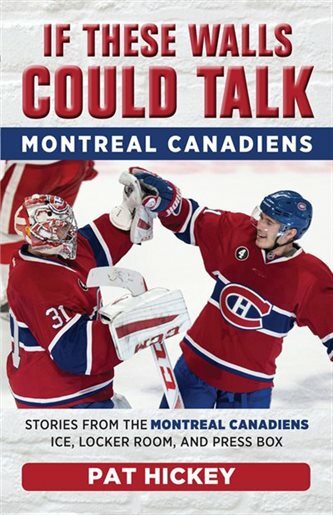 The first was 100 Things Canadiens Fans Should Know & Do Before They Die which came out in 2015, and the most recent, from the fall of 2018, was If These Walls Could Talk: Montreal Canadiens: Stories from the Montreal Canadiens Ice, Locker Room, and Press Box. In a recent early morning phone chat, the Canadiens beat writer reflected on the idea of a formatted book. With 100 Things, “that was a little more formatted. They wanted some things fans could do, a place where to eat before a game, and that sort of thing,” he said. Hickey has a rich sportswriting history, going back to the defunct Montreal Star in 1968; he's been with the Gazette for 25 years now. He's worked in other parts of the country at various times too. “One thing that I found that was interesting was when I started, I started writing things, I remembered things happening a certain way, and then I go back and look at the incident and realize, that's not the way it happened at all!” he said with a chuckle. All told, he said If These Walls Could Talk “went pretty easy,” coming together pretty quickly over the course of roughly two months. The freedom to write longer compared to shrinking newspapers was nice, he said. On the side, Hickey does some work for College Hockey Inc. (www.collegehockeyinc.com) and has a pitch in to Triumph Books on that subject too. He's been working here and there on his memoirs as well. Both are his format to create. 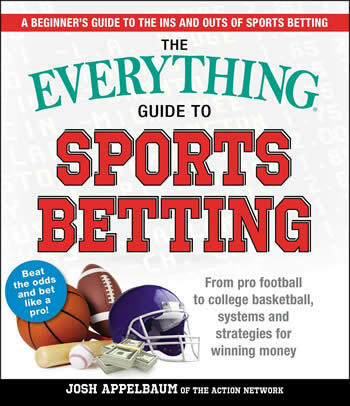 Don't go looking for much hockey in The Everything Guide to Sports Betting: From Pro Football to College Basketball, Systems and Strategies for Winning. The book, which came out in February from Simon & Schuster's Adams Media division, barely touches on hockey. There's no mention of it at all in the table of contents, which does break out pro and college football and basketball, and Major League Baseball ... and Fantasy Sports. But not hockey. It's interesting when hockey is brought up in context of the supposedly more popular betting sports, like why spreads are way more frequently used in basketball and football, than baseball and hockey. Legendary writer/broadcaster Brian McFarlane has another book in him—he's still trying to get to 100! This fall, Dundurn Press will publish 101 Fascinating Hockey Facts.